It’s time to move past the “Dark Reign” era and on to “Siege,” recounting a war between the Asgardians and Norman Osborn’s H.A.M.M.E.R. Many of the “Dark Reign” plot threads were wrapped up in “Siege” and the new “Heroic Age” era began. The Thunderbolts have come a long way, too, since my review of Justice, Like Lightning. The title has gone through some changes of concept recently. What began as a team of redemptive criminals masquerading as superheroes was first retooled into a Fight Club rip-off (if you’ve ever heard the derogatory term “Fightbolts,” it refers to the last few issues of the original run). The New Thunderbolts reboot in 2004 returned the team to its roots, eventually growing into an army of villains during “Civil War.” Warren Ellis then famously had Norman Osborn take over the team, resulting in violent new members like Venom and Bullseye and a change of concept from redemption to Marvel’s version of Suicide Squad. That team then became the Dark Avengers, which went back to the original concept in some ways, while a new team of Thunderbolts emerged as Osborn’s personal killing squad. 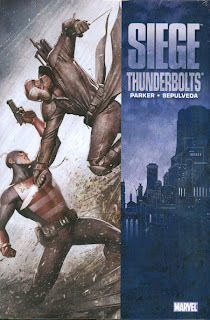 Siege: Thunderbolts takes place during the inevitable “fall” period of any empire. It was only a matter of time before Norman Osborn came crashing down spectacularly, and his team of killers is along for the ride, if only peripherally. In the two stories presented here, Osborn is getting ready for the siege of Asgard, so he’s mostly seen in holographic messages. The team is led by Scourge, who is actually Nuke, the flag-faced, pill-popping villain initially seen in Daredevil: Born Again. As a military man, he tries to keep his team in line . . . but all of his teammates have a few issues with authority. Mister X is a constantly shirtless, egotistical and violence-addicted Wolverine villain whose telepathic fight abilities are reminiscent of the Midnighter from The Authority. The Headsman, Cleavon Twain, is a hick who uses Green Goblin-style technology -- and yes, that is his real name, and yes, there is no way he could have gone into any other business. Apart from these whackos and the Grizzly, a super-strong Spider-Man foe who joins up later, there are a few more complex characters. Paladin is a hired gun who has been around for a long time and who starts having some suspicious feelings which may resemble a conscience. The new “Irredeemable” Ant-Man, who premiered in a great series by Robert Kirkman and Phil Hester a few years back, is just an all-out coward and opportunist who wants nothing more than to get out of the Thunderbolts. The most interesting character here is the Ghost, an anti-corporate raider who has been a thorn in Iron Man’s side for decades. He’s gone through an impressive redesign, both physically and character-wise, and while it began in the Iron Man: The Inevitable mini-series, Thunderbolts takes it even further. Starting out as an alternate version of the Taskmaster, he’s become a spindly, gas-masked creep, with the social manners and speech patterns to match it. However, he has his own weird moral code. I’ll talk about the Ghost more in later Thunderbolts reviews and the Invincible Iron Man: Stark Disassembled review. While Andy Diggle (creator of The Loners) put this team together, it’s Jeff Parker who takes the team apart. Sometimes, when a new writer is brought on board for a “bold, new direction,” it’s easy to just kill everyone off and pretend the past never happened. However, Parker successfully transitions from this band of killers into the upcoming “Heroic Age” incarnation. In the first story, this is accomplished by using the Agents of Atlas. This team is Marvel’s closest equivalent to the Justice Society of America in that they’re heroes of the past reinvigorated by a continuity-happy author to create a fantastic team in the present. Like an inverse of the original Thunderbolts, the Atlas Foundation and its Agents pretend to be a shady business operation while they secretly use their funds and power to do good deeds. The Grizzly faced off against them previously, and he certainly gets some revenge in. The actual “Siege” tie-in finds the Thunderbolts as raiders of the Asgardian arsenal to find Gungnir, the Spear of Odin. In doing so, they face off against the Mighty Avengers, which on the surface has a rather odd line-up, featuring a younger, reborn Vision; Stature, former Young Avenger and the daughter of the second Ant-Man; U.S. Agent, the super-patriotic Captain America replacement/knock-off; and Amadeus Cho, Hercules’ super-smart buddy who thinks in mathematical equations. Yet despite lacking powerhouses (Herc was dead-ish at the time, Hank Pym was busy and Quicksilver gets there late), this odd assemblage puts up a good fight in one of the best laid-out superhero battles I’ve read in a while. Much of this is because the villains aren’t pulling their punches; at least two are actively murderous, and most of the others wouldn’t mind taking some Avengers down permanently as well. There is also some giant-on-giant combat, which has been depressingly rare recently. In both stories, Parker gets to indulge in some very dark humor, including a post-hypnotic suggestion gone horribly wrong and Mister X’s fantastic moment in which he realizes that he just killed a god. Helping this dark story is some dark artwork from Miguel Sepulveda and Wellinton Alves. While I have never read anything drawn by Sepulveda before, Alves’ art has improved tremendously from his fill-in stint during War Machine (although I have a feeling that may have been a rushed job due to time constraints). Thankfully, there are no major artistic shifts, which can often ruin an ongoing story. The art is heavy on the shadows, and most of the main characters have a dark color palette; even the constantly shirtless Mister X has numerous black chest tattoos. Standing out amongst this is the pure-white Ghost, which provides some good contrast. When at their base or in-transit, the lighting is always red, darkening things even more. One design quibble I do have is the change in helmet design for Ant-Man. He loses the forehead antennae and instead has a helmet that wouldn’t look out of place on an Autobot. Personally, I feel that Ant-Man should always have an ant-like head, or at least one that isn’t so distractingly un-ant-like. Siege: Thunderbolts is a good pair of stories, especially if you like anti-heroes. This is at the end of an era, so I’m sure some of the story beats would be even more powerful with the context of previous storylines. I’d still say it rates a look, if only because it might hook you on Agents of Atlas.